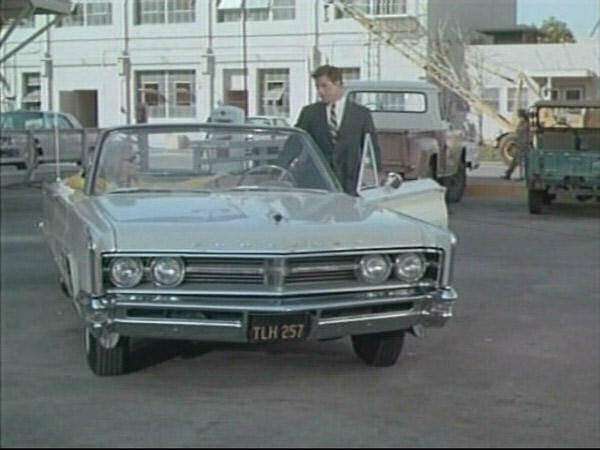 IMCDb.org: 1966 Chrysler 300 Convertible in "The Green Hornet, 1966-1967"
This Chrysler is the personal vehicle of the show's lead character, Britt Reid, and is featured in most episodes. Britt Reid is secretly The Green Hornet, on police records a wanted criminal. He hides the Hornet's car, the Black Beauty, in the same one-car garage as the Chrysler. How does he manage this? Watch the movie. If it is in several episodes, try to see if one of the cars they used was a letter car. I'm just curious. The letter series 300's were last produced in 1965 but I love the looks of this car! Check out the Corpse of the Year clip on youtube to see Britt Reid's 300 and Both Black Beautys in one clip. Love the show and the 66/67 Mopars they used in it. Directly behind Britt is an International A-120 or B-120 All Wheel Drive pickup in Whitecap White over Coral.